The biggest news from the reborn Fiat brand at the 2012 LA Auto Show was the formal introduction of the new electric 500e but the Italian automaker countered its super-green model with a new high performance Abarth version of their popular 500c convertible – packing all of the greatness of the traditional hard-top Abarth combined with a refreshing open air driving experience. The 2013 Fiat 500c Abarth is powered by the same 1.4L MultiAir turbocharged, twin intercooled 4-cylinder mill from the hardtop model and like the other Abarth 500s in the US, the new Abarth Cabrio packs 160 horsepower and 150lb-ft of torque - or 170lb-ft when the driver selects the Abarth Sport mode. This power output is aided by the Abarth cold air induction setup and a free flowing exhaust system that is – in my humble opinion – absolutely the best sounding exhaust system offered on any 4-cylinder car in the US market. This power is funneled to the front wheels via a sport tuned 5-speed manual transmission and a set of equal length (and heavy duty) half shafts that help to handle the load without the dreaded “torque steer” experienced by some high performance front wheel drive models. The 2013 Fiat 500c Abarth also packs a track tuned suspension setup featuring enhanced front and rear components (compared to the standard Fiat 500c) with Koni struts that provide a stiffer, sportier ride while also lowering the car for a more aggressive stance – all the while working to filter out the harshness of the road surface without hurting handling performance. The 500c Abarth next adds an electronic power steering package with an increased gear ratio for improved response and feedback through the race inspired flat-bottom steering wheel. Finally, the new drop top Abarth 500 gets a heavily revised braking system featuring some massive 11 inch rotors pressed between high performance brake pads for incredible stopping power while the Abarth-tuned three-mode electronic stability control system (ESC) allows the driver to select a drive mode that optimizes their driving experience. In addition to packing all of the high performance goodies from the hard topped model, the 2013 Fiat 500c Abarth wears a very similar exterior design to the fixed roof hatchback Abarth including an aggressive front fascia, deeper side sills, uniquely branded lightweight wheels and a lower rear fascia that houses the Abarth dual exhaust tips. The 500c Abarth also sports the same Abarth scorpion logos on the front, sides and rear as the hatchback. Where the 2013 Fiat 500c Abarth differs the most is, of course, the retractable cloth convertible top that utilizes the same innovative design as the non-Abarth 500c. Unlike most convertibles that lose much of their structural rigidity due to the lack of a proper solid roofline, the 500c has a top that travels on a set of rails embedded in the traditional roofline design. Thanks to this, the convertible Fiat 500 offers very similar chassis strength to the hatchback model while also allowing for the open air driving experience that one expects from a convertible. One of the coolest features of the new 500c Abarth is the rear spoiler that is mounted high on the roofline (just like the Abarth hatchback) but when the top drops – so does this rear spoiler. 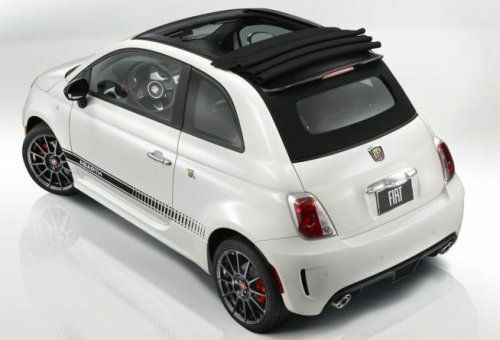 When the cloth top is in the upright and locked position, the 500c Abarth spoiler helps to provide downforce at high speeds but when the top goes down, the rear spoiler drops with it. Like the non-Abarth models, the new high performance 500c Abarth allows the driver to operate the convertible top at speeds up to 60 miles per hour if they want the roof to slide back to the unique rear spoiler while having the roofline tuck down behind the rear seats will require the driver to drop down to 50 miles per hour. This is a great feature for those drivers on the move who don’t want to have to pull over to put the top down when cruising. The image above on the right shows the 500c Abarth with the top retracted to the rear spoiler but when fully dropped – the top tucks down against the upper portion of the trunk lid. Finally, the interior of the 2013 Fiat 500c Abarth is outfitted with leather race inspired bucket seats up front with revised rear seats as well. In addition to the flat bottomed sport steering wheel, the 500c Abarth receives a boost gauge pod with an integrated shift light as well as a high end sound system provided by Beats By Dre – making the 500c Abarth the first convertible in the US market to offer this booming sound system in stock form with studio quality sound provided by six premium speakers and an 8 inch subwoofer. The 2013 Fiat 500c Abarth is expected to hit US showrooms during the first quarter of 2013 and in addition to all of the high performance features of the new drop top Abarth – buyers are entitled to a trip to the Richard Petty Driving School for the Abarth Driving Experience where trained race instructors will teach you how to make the most of your new high performance Italian convertible.